Heidi Rodewald composes propulsive music to accompany Donna Di Novelli’s powerful lyrics for The Good Swimmer, a project seven years in the making. A young lifeguard grapples with the legacy of the one she could not save, her brother in Vietnam. 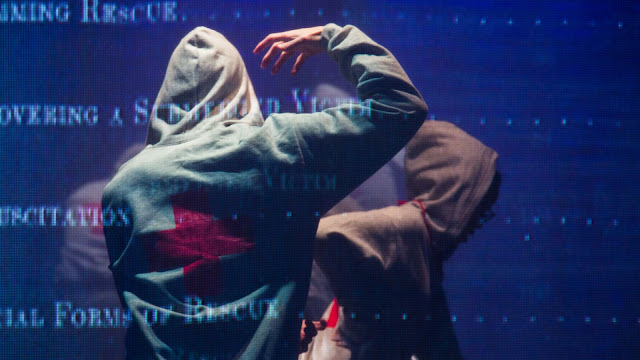 This music-theater pop requiem transcends time and brings to the forefront the senselessness of war, begging the question, how do we truly honor our fallen soldiers? Context is everything, so we’ve provided some content for you to read and watch. After you’ve attended the show, let us know what you thought by posting in the comments below and on social media using #GoodSwimmer. Learn more about the creators of The Good Swimmer. Di Novelli and Rodewald speak about The Good Swimmer before its debut at the Prototype Festival in 2016. Di Novelli and Rodewald talk about their inspiration for The Good Swimmer. What did you think? Tell us what's on your mind in the comments below and on social media using #GoodSwimmer. The music and the visuals were fabulous. The music was lyrical and urgent.The trumpeter was wonderful; she sounded like a flugelhorn. The singing was good, but completely incomprehensible. Occasionally there were words you could pick up, but it was mostly just sound. It could be that the PA was at fault. Even though the music was so absorbing and the visuals quite good, the ideas were a mystery. Reading even the first paragraph of the blog explained what was going on, but the performance did not. I did not mind that because the music was excellent. I loved it. What was the point of having the words and the "backstory" if it was absent in the performance? A note about the Vietnam war from someone who vigorously opposed it from 1963 to 1975 when the Americans finally left: there was no strong swimmer in the Eisenhower,Kennedy, Johnson or Nixon administration. Or the Army. There was no one who led us out of the war until it was too late. The war was a defeat before it began. We who opposed the war and who refused to go could only save ourselves and protest so that we forced the country out of the war... eventually. Why did the authors keep the topic a secret? Why are there no comments on this blog? My wife read the article in the Times on line on the way home and then looked for more info. Did anyone else? Why should anyone suspect that the blog and the info existed? What was the secret for?? Stew narrates his plays. What a difference! It was a wonderful concert, but the story was missing.